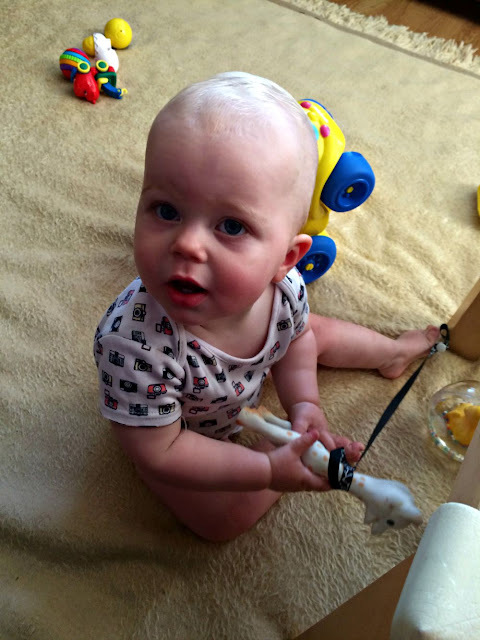 So, Alex turned one earlier in the week, so what more appropriate time than now to write his 12 months update. I’ve been looking through all the pictures I took over the last few weeks, and actually there are very few pictures of him smiling, which is so not like him. He’s had a bit of a rough ride of late; he’s been ill a lot this month, with various gastro bugs and other viruses causing him much bother, and he’s still not quite over the pretty harsh virus he caught over the weekend. It really knocked him for six, and he still has a viral rash all over his body and is quite subdued and serious. I really hope he gets his mojo back, soon, as I miss my smiley and happy little boy, whose giggles and laughs are so contagious. Ever since he started crawling, he’s been unstoppable, and he’s picking up speed every day. He whizzes from room to room super fast, and when we’re not careful, he’ll pull out drawers, and pick stuff up that he’s not supposed to, or grab or bash things etc. I’m not going to lie, it’s quite intense, as we really can’t take our eyes off him – I had forgotten just how full-on this phase is. I’m perpetually knackered, but it’s also really sweet and endearing to see how he’s discovering the world, so worth every bit of exhaustion. He’s not making any attempts at walking yet, which is just as well, because a) that would be even more intense, and b) I’m still enjoying that last bit of baby stage, before he turns into a bona fide toddler, so there’s no hurry there. He loves standing up though, and will take every opportunity to pull himself up and get a change of perspective. His personality is really developing now, it’s lovely to see. He’s bright as a button, and very nosy and observant. He’s also extremely determined and will not give up when he really wants something, even – or especially – when it’s something he’s not supposed to have and we pull him away. He will forever try to go back, and he won’t take no for an answer. It’s exhausting, but I also actually admire his resolve and sheer willpower! The only downside is that he, well, really doesn’t take no for an answer – in fact, whenever I say “no” or “nein” (in German) to teach him that he’s not allowed something, he just giggles. He finds “no” and my “serious face” hilarious, which could become a bit of a problem in the future. Hmm. I think he might be spending a lot of time on the naughty step in the future, hehe. He’s actually hilarious, so funny. I think he’s going to have a great sense of humour, probably quite cheeky. He’s already a bit naughty, I’m pretty sure he knows it, too, and is already starting to test his boundaries, so we have a lot more of this to come. He’s also recently cut his fifth tooth, and a sixth one is coming through, I believe, which has added to his health woes lately. I really hope we’ll have an ill-ness, bug and virus-free month now, and we get our vivacious little boy back.